1. In a large saute pan over medium heat add olive oil and heat until shimmering. Add garlic and shallot and saute until caramelized about 10 minutes. Add spinach and cook 30 seconds. 2. Deglaze with Pernod. Add cream, cream cheese, pureed roasted garlic and soppressata. Stir to combine. Cook for 5 minutes until spinach is wilted. Remove from heat and allow to cool. 3. In a small bowl combine parmesan cheese and breadcrumbs. Stir to combine. 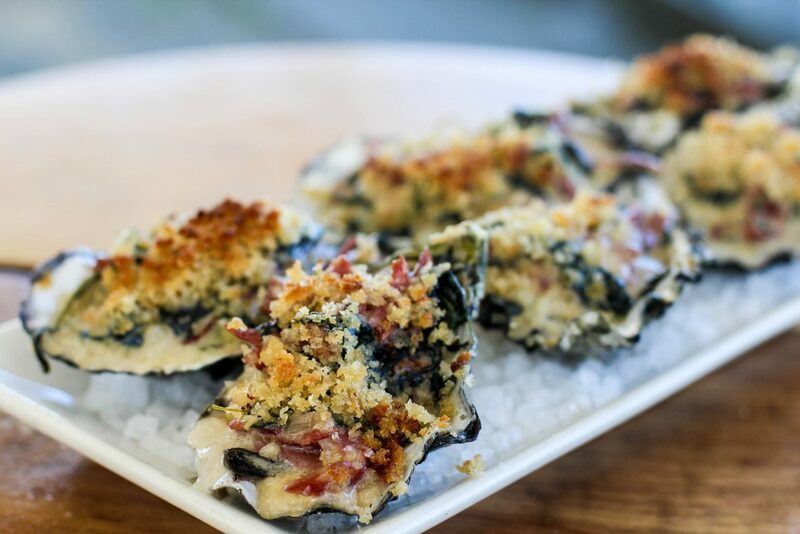 Place a generous dollop of spinach mixture inside shucked oyster shell and sprinkle with parmesan breadcrumbs. Place filled oyster shell on sheet pan. 4. Bake 10-15 minutes or until breadcrumbs are golden brown. 5. To serve place baked oyster on a bed of rock salt to hold them in place.